Teach Your Australian Shepherd 100 English Words. Obedience training, housebreaking, potty training, and crate training for Australian Shepherd puppies. 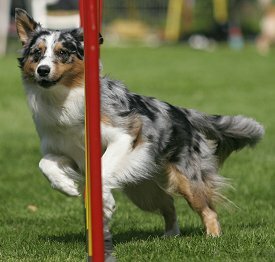 Dog training tips for Australian Shepherds. It depends! As herding dogs, Australian Shepherds were bred to follow directions from the person in charge of the flock. That heritage comes in mighty handy when you need your Aussie to follow your directions around the house. But Australian Shepherds aren't robots. Herding dogs sometimes need to think for themselves and make up their own minds when they're trying to find a lost sheep or keep their flock together. So herding dogs aren't necessarily pushovers to train. The higher-energy, more hyper-reactive Aussies are especially challenging, because unless they get enough exercise and mental stimulation, they aren't calm enough to listen to you. Boredom is the leading cause of destructive behavior and barking in all of the most intelligent dog breeds. So when you ask, "How easy is it – training an Australian Shepherd?" my answer is, "It can be easy or a bit challenging. It depends on whether you're providing sufficient companionship and exercise to keep the dog satisfied. It also depends on the temperament and personality of the individual dog, plus your own dog training skills." That's where I come in. 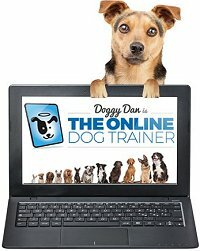 My dog training articles will help you train your Australian Shepherd to be well-mannered and well-behaved. I've been working with dogs for 35+ years, as a dog trainer, canine psychologist, breed advisor, and author of 15 books about dogs. Teach your Australian Shepherd to play fetch. It's an easy way to exercise your dog! Australian Shepherds were developed to be working dogs, not pets to hang around the house or stick out in the yard. Your Australian Shepherd puppy comes hardwired with genes for high energy, which needs to be vented through exercise and active play sessions – like fetch games. 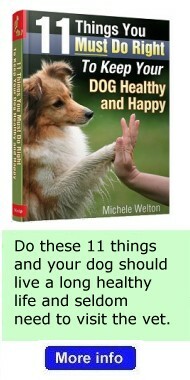 I show you how to teach these games in my dog training book, Teach Your Dog 100 English Words. Teach your Australian Shepherd that he cannot chase your cat or small dog. Herding dogs like Australian Shepherds have powerful chasing (and nipping) instincts, and these must be quashed right from the beginning if you want to keep smaller pets safe. Teach your Australian Shepherd to respect you. Respect Training is the key to training your Australian Shepherd to be well-behaved. Teach the right words to your Aussie. My method of training Australian Shepherds includes teaching specific words in specific ways so that your dog not only learns the words but also develops the respectful attitude that makes him happy to obey you. "Give", "Drop it", and "Leave it" are important words to teach your Australian Shepherd. This breed is constantly picking things up, carrying things around, swallowing things, etc. You need to be able to get your Australian Shepherd to quickly drop an object or give it to you, or not pick it up in the first place. 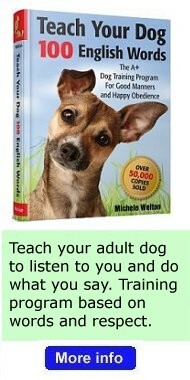 Stop searching for dog training tips for each behavior problem. There are no little tricks that stop individual behavior problems. You stop most behavior problems by providing your dog with more exercise and interesting activities, providing more hours of companionship, and establishing the right relationship of respect between you and your dog. Start training your Australian Shepherd puppy the moment you bring him home. But you need to teach the right things in the right ways. Read more about training Australian Shepherd puppies. Start housebreaking right away. Australian Shepherds are usually easy to housebreak, but you need to do it right. Read more about housebreaking Australian Shepherds. Socialize your Australian Shepherd with strangers and other dogs. Some Australian Shepherds love everyone and need to be taught to control their over-enthusiasm at greeting people. Other Australian Shepherds are standoffish, and without careful socialization, they may become suspicious or fearful of everyone. 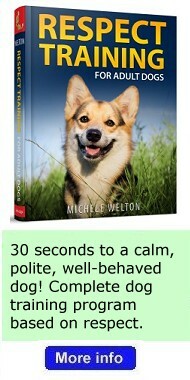 Read more about why your dog acts the way he does toward strangers and other animals.